If you want, anyways. We gave this smooth shift silhouette a removable tie belt for a fitted or loose look. Bonus: It’s wrinkle resistant and comes with pockets. Made in NYC. Flattering shift dress with a relaxed fit. Hemline falls above the knee. 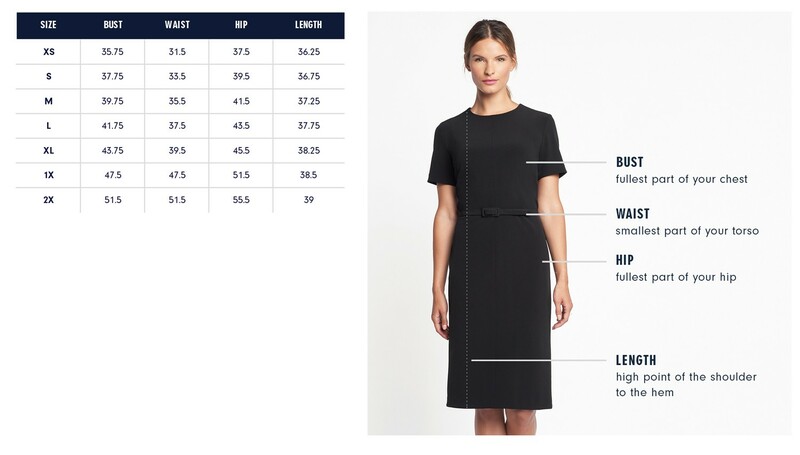 Our model in green and black is 5’8 ½” and wearing a size S. Our model in navy and burgundy is 5’9.5” and wearing a size S.
Below are the exact measurements of the Riverside Dress. All measurements are in inches. For general brand fit, sizing, and measurements, please visit our Brand Fit & Size Guide. Flattering shift dress with a relaxed fit. Hemline falls above the knee. When I design such a minimal piece the fabric becomes even more important. I loved that this fabric would be durable and flattering... and machine washable. Features: Side seam pockets and removable sash belt.